Good morning, good morning, spring fever is here – at least at my end of the world. 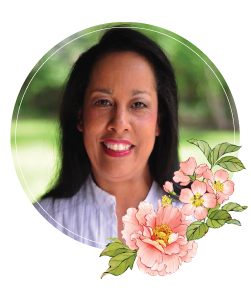 I had appointments early yesterday morning and the day was so pretty that I stayed out as long as possible :-) Today is Day of Giving Friday so I picked out a spring time card for todays post! Behind the scenes I’m working on a tutorial with an unlikely hero that you already own! Here’s another older classic that I encourage you to pull out to set your heart right for spring that’s coming! I used Spellbinders Gold Labels Four along with Spellbinders Labels Four and Spellbinders Les Papillions. Can’t you just see that butterfly flitting among the flowers? (oh that’s right, the flowers aren’t out yet – but they are coming). 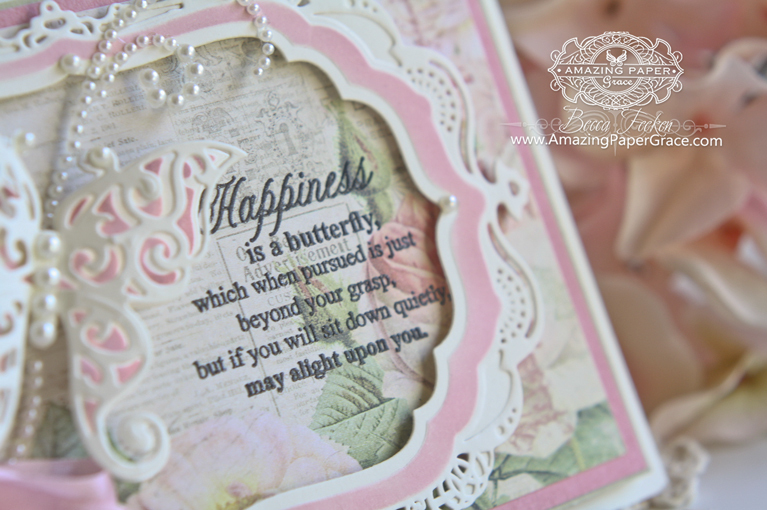 Powdery pink stencilling just makes it all pop and I just love stamping my sentiment directly on design paper. If you’re not familiar with Day of Giving Friday, every Friday I give away a card to a reader who leaves a comment – here’s a link to my FAQ’s just check out #11. For your comment today – what music are you listening to when you sit down to your craft table and how does it inspire you? For me, nothing is wrong in the world when I create to a house full of music! Happy weekend! I have lots planner, several overdue gifts to make, filming a video and picture taking. Hope you’re up to something that tickles your heart! Sorry I touched something on me screen, did not complete my sentence. I remember this card from when you originally featured it on your blog. It is still one of your prettiest! Thank you for showing it again. It is just lovely! ohhh gosh Becca, I absolutely love this card, fave colour pink, love butterflies and labels four is one of my all time fave die sets, even though I don’t have the fancier counterparts to it yet, I am hopefully going to get my hands on them one day soon. This is such a soft delicate looking card with dog rose background on the paper and the soft colours of the paper just letting you drift off to the sunny day when the meadow flowers are swaying in the gentle breeze and you are lying back on a blanket stretched out and the cares of the day just floating away along with the beautiful butterflies. Isn’t it amazing what the imagination can do just by seeing something. Mum always said i let my imagination run away with me sometimes as i was always floating off to a better place than i was in. I hope that it takes you off some where nice as well Becca where you can make your dreams come true. Wow, I am amazed at the # of gals that work in silence! Even if I am at club I bring my IPad speaker with me. I like silence when I read & when I am cooking from a recipe. Otherwise I LOVE music! My exercise is even to music. It sooooo makes me happy! I love most types of music. Country, pop, classical, opera, rap, alternative rock, rock ‘n roll, gospel, contemporary. Not so much Jazz & not bluegrass. Also sometimes Netflix, lol. Becca, Truly a beautiful card. Thanks for sharing. I listen to a variety of music. Sometimes it’s Adele’s Hello or Bruno Mars’ Uptown Funk. Then there is Luther Vandross’ music, Whitney Houston, and Teddy Pendgrass. Then there is gospel that I like to listen to. Such a BEAUTIFUL card with a perfect sentiment Becca! Wonderful combo of dies!!! Would love to win it! My husband has classical music softly playing in our house so that is what I listen to in my studio…when he is not home I put on a CD of hymns and hum and listen as I create. It is a rarity that I am able to turn on music in my household, let alone craft in the accompaniment of music. Our TV runs non stop these days, except when I am cleaning. I send everyone to their rooms or outdoors for outdoor projects, kick on the music and clean till my heart is content. They all know better then to mess with me while I am cleaning the house. LOL But I prefer to craft while watching TV and usually with the family underfoot. I love this card. The colors are soothing and the card is gorgeous and I love that you have stamped the sentiment directly on to the patterned paper. Beautiful. Slow soft Classical Music for me ,and a bit of Maria Callas . As always, this is such a beautiful card! What a truly stunning card today. Thank you. My favourite music while crafting is one of the classics like Ella Fitzerald, Frank Sinatra or Dean Martin!!! the person who recieves it. Makes me yearn for bright summer days. is one of your home grown musicians by the name of Joe bonamassa. Have a fabulous and fun weekend. I love to listen to Adele sing! Oh, how beautiful and moving. Hi Becca, I usually have the TV on when I am creating. Another beautiful card. I love the pink. Can you show again how to put the ink around the die? I like to play soft music or have the TV on when I work on my cards. Love, love this card so very much. It depends on my mood…. Most often I love quiet, or relaxing music without vocals. I love to listen to music when I craft mostly l like music from the sixties and seventies ,but I also love classical music. Always so pretty in pink. I like all different types of music it just depends on the mood I am in. Sometimes it will be with no music on. But in my house it’s playing almost all the time,especially if I am doing housework lol then I turn up the beat! Good morning Becca, wow what a fabulous card I love it!!! Has for the weather it was freezing when I got up at 6 this morning : ( I had to scrape ice off my windscreen I was absolutely perished!!! My taste in music is very eclectic from Nat King Cole, Elvis, Beatles, Alice Cooper, Yes, Aerosmith, Classical, Film scores, Rolling Stones, Country all the 50s and 60s and far to many to write. I could go on for day’s!!! But I craft in silence no music no TV it’s wonderful to get lost in your own thoughts!!! Well, I love everything about this card-fancy, filigree, flourish, roses, pearls and that lovely openwork butterfly…and a great sentiment-PERFECT! It’s noisy in my home so I usually craft in silence BUT, when I lived alone, I always had music on: Gregorian Chant; David Davidson’s beautiful violin-Hymns of Hope; Steven Hill’s piano orchestrations-On Eagle’s Wings and Kim Robertson’s ethereal harp music-Tender Shepherd (ya think there’s a theme here?) Some heavenly inspiration for sure! I’m making cards this weekend – Yippee! Morning Becca, what a beautiful card this morning made with your Labels 4 and yes that butterfly is lovely. the music I like to listen to is Andrew Lloyd Webbers music. You seem to be in a dreamy mood. How lovely. When making cards I play a CD that sort of fits the mood. creating a lot of distress inked cards at the moment and “TAPESTRY” BY Carol King is my fav at the moment. What a lovely card, Becca! Once again, your card touched my heart. Be still my beating heart! Loved seeing this card again! Hello Becca your card is so spring pastel perfect ! Beautiful butterfly on your already gorgeous card. I love listening to gospel music. Not the newer stuff, but the oldies. Even have gospel CD’s in my car. You card is beautiful,as always, I love your site thank You. When I am making cards I always have my music on, country, but I listen to all kinds, when I am mowing my lawned I listen to rock so I can keep on going, when I am on a beach I listen to everything, but when I am making cards I love my country and I can work for hours. No matter what I am doing the music is on, music is better than TV any day. Oh Becca what a stunning card. . . Spring is just around the corner in the PNW, all the tulips and crocus are springing up, just need the Robins to return and start singing! Your work is just gorgeous and I so love your Blog, it’s a refreshing quiet time for me, thank you! Very pretty card. The bow and stick pen just finish this beautiful card. Hi Becca, this is absolutely gorgeous thinking about trying to replicate it for one of my granddaughters. I usually craft in silence as after having 5 teanagers in the house for years it is lovely to have silence and no more music. Sorry for the absence again and usually late lol! Wow this is stunning, such a pretty card, love the design and the sentiment, so true lol! I hope you are well and life is treating you good? I’m so incredibly busy at the moment and was working until so late last night, that I didn’t get around to looking at Amazing Paper Grace yesterday! I’m sorry that I missed the chance to win this absolutely fabulous card. It’s so pretty – and I’ve got all the dies! I listen to the radio mostly so the music I hear is quite random and it gives an opportunity to keep up with the news! 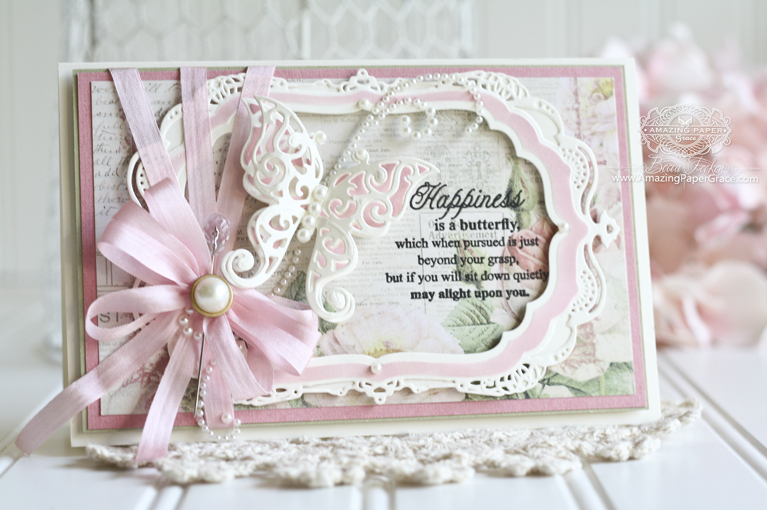 Hi Becca, A stunning card, gorgeous die-cuts and papers and a very pretty bow. When I am crafting I normally have the TV on in the background, Previously I tried listening to my audiobooks on my Kindle whilst crafting, but found that I can only do one thing at a time and I was missing all the ‘story’ so stopped doing that haha, so now I have the background noise of Create and Craft on TV. When I am decorating though, I always have Il Divo CDs on in the background and I sing along with them whilst hanging wallpaper or painting, it really lifts my spirits. A Beccabeautiful card as usual!!! Hello Becca – I hope you are having a wonderful day today! I’m a huge fan of the Labels Four die sets and you’ve used the original die to create a beautiful card. I love that you stenciled the frame rather than choosing color cardstock. The card is lovely and pink is always my favorite color. If I’m listening to music, I like oldies and gospel music. As a teenager in the 60’s, the oldies take me back to a different time full of treasured memories. Gospel music fills my heart with inspiration and reminds me to give thanks for all the blessings in my life. I also enjoy crafting in silence. Sometimes it’s the quiet around me that brings peace and tranquility. I like to listen to Enja whilst crafting or some yoga music I have (I don’t DO yoga though!) I find it very uplifting and easier to craft that way as I can’t craft when I’m feeling down.